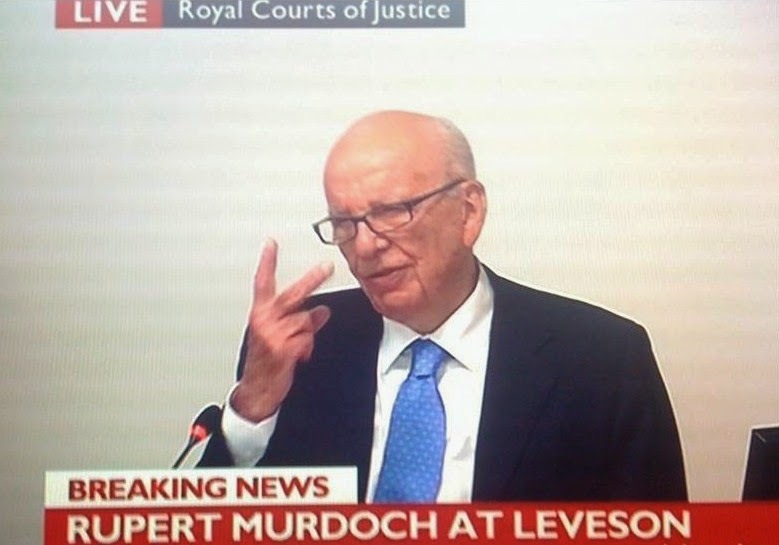 Zelo Street: Murdoch Cooling On Tories? With just over two months to go before the General Election, the last thing the Tories need is for its supporters in the press to wobble. Whatever may have been uncertain and wavering over the recent past, when push has come to shove, the right-leaning part of the Fourth Estate has always been there for The Blue Team. Only the Mirror titles, Independent and Guardian have dissented from this view. That's what I think of youse bladdy immigration policy, ya bladdy Tory drongoes! But with Richard “Dirty” Desmond leaning towards Nigel “Thirsty” Farage and his fellow saloon bar propper-uppers at UKIP, and upheaval at the Telegraph as more and more experienced journalists are sent down the road, this united front of certainty has begun to crack. Still, the Murdoch and Rothermere press was on-side, wasn’t it? The Chipping Norton connections of Young Dave were still relevant, weren’t they? I wouldn’t be too sure about that: for starters, as I noted earlier today, Rebekah Brooks, central to the Chipping Norton “set”, has either left for the USA, or will be doing so very soon. 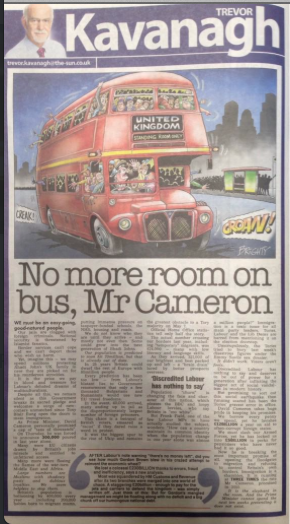 And the Murdoch press is getting restive about the Tories, as witness the latest slice of xenophobia from the Super Soaraway Currant Bun’s faithful retainer Trevor Kavanagh, titled “No more room on [the] bus, Mr Cameron”. While Kav is happy to lambast Mil The Younger - “Discredited Labour has nothing to say” - he warns “As Prime Minister, David Cameron personally promised a cap of ‘tens of thousands’. On Thursday, he was forced to announce 300,000 poured in last year alone … Many were EU citizens … Many more were fleeing the flames of war-torn Middle East and Africa … Large numbers are Muslims with shadowy pasts and dubious loyalties”. So far, so routinely bigoted, but the message, together with kicking Cameron over foreign aid, cuts to the armed forces, and being too generous to pensioners, is the assertion that immigration “was the biggest spur to the rise of UKIP and the greatest obstacle to a Tory majority on May 7”. That message is clear: the Sun will keep putting the boot into Labour, but it is less than enthusiastic about backing the Tories. Where does this stance come from? As if you need to ask: as with anything at the Sun, the big decisions come from one man. 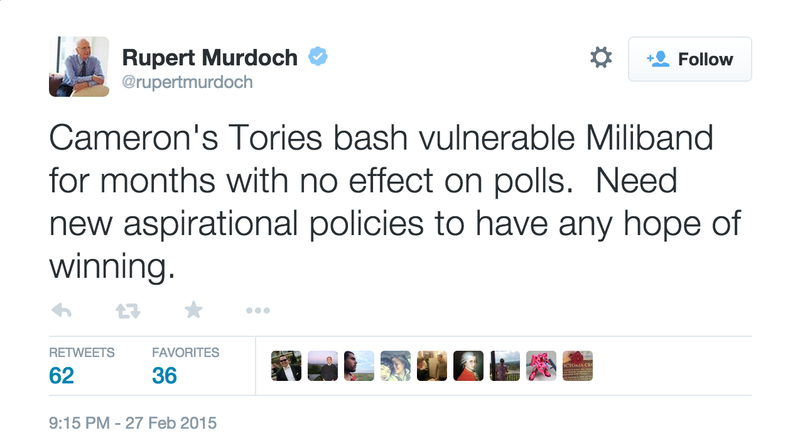 Rupert Murdoch Tweeted on Friday “Cameron's Tories bash vulnerable Miliband for months with no effect on polls. Need new aspirational policies to have any hope of winning”. Now we know what “aspirational” means. “Aspirational” equals dumping on Muslims and Romanians and trimming towards the Kippers. It means the UK turning its back on aid commitments overseas. It means pretending we don’t do pretty well out of immigration. Creepy Uncle Rupe is telling Dave that if he doesn’t do a bit of that, he won’t get back in. Of course, as Andrew Neil has told, the Sun may no longer have real political clout. The question for Cameron, as Harry Callahan put it, is whether he feels lucky. Well, does he?